Gastrointestinal (GI) primary cells represent a powerful approach for the in vitro study of the physiopathology of this unique tissue. Researchers have now identify intimate interactions between GI cells and its microbia with neurological disorders pointing out the need to access highly characterized sources of GI primary cells to design reliable and more physiologically relevant in vitro cellular models. The involvement of the gut microbioma in the pathogenesis and treatment of various diseases has prompted the primary cell producer Cell Applications to develop three Human GI cell types from distinct organs of the digestive tract: Colonic Epithelial Primary Cells, Intestinal Epithelial Primary Cells and Gastric Epithelial Primary Cells. The organization of the epithelium of the small intestine and colon into crypts is generally comparable. However, histologically there are two important differences between the two types of epithelia. The colonic epithelium has a flat epithelium surface and does not have villi. 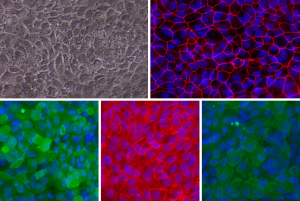 Regeneration occurs from units embedded within the crypts, each containing about 6–10 stem cells, while differentiated epithelial cells reside at the surface. Human colonic epithelium is linked to various human diseases and disorders such as Ulcerative Colitis and Colon Cancer, necessitating a better understanding of epithelial cell function and their role in disease-affected tissues. Cell Application/tebu-bio’s colonic epithelial culture system provides a unique tool for the investigation of colon epithelial cell physiology and evaluation of therapeutic mediators. Gastrointestinal (GI) Epithelial Cell (HInEpC) monolayer. Top left: Phase contrast. Top right (Red): ZO-1. Bottom left (Green): Villin. Bottom middle (Red): Na+/K+ ATPase. Bottom right (Green) pan-Cytokeratin. Blue: DAPI. The intestinal epithelium is a single layer of cells organized into crypts and villi, known as the most rapidly self-renewing tissue in adult mammals. The cells that line the intestinal lumen perform the primary functions of digestion, water and nutrient absorption, and forms a barrier against luminal pathogens. Cell Applications / tebu-bio’ intestinal epithelial culture system provides outstanding resource for investigation of intestinal epithelial cell physiology related to GI infection, inflammatory bowel disease (IBD) like Crohn’s disease, ulcerative colitis, and intestinal cancer. This epithelial cell culture system can be efficiently used as a test platform for the potential drug candidates and disease modulators. 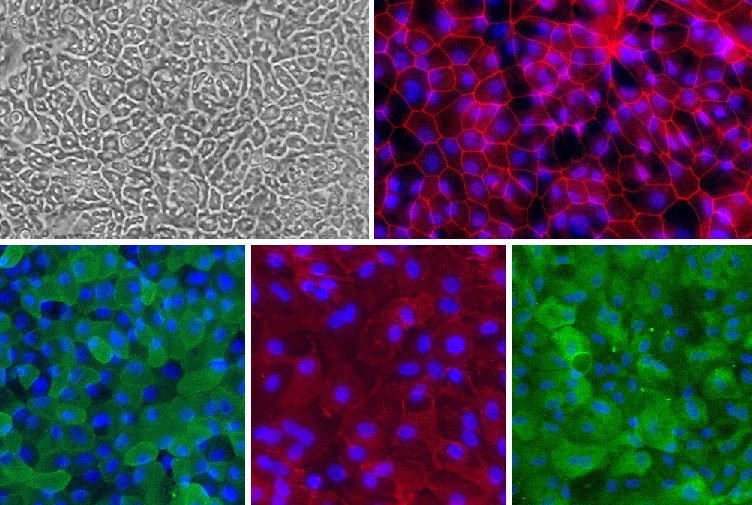 Other applications include functional analysis of intestinal epithelium, GI disease modeling, preclinical testing, drug compound screening and other validation assays. Gastrointestinal (GI) Epithelial Cell (HGaEpC) monolayer. Top left: Phase contrast. Top right (Red): ZO-1. Bottom left (Green): Villin. Bottom middle (Red): Na+/K+ ATPase. Bottom right (Green) pan-Cytokeratin. Blue: DAPI. The gastric mucosa is the mucous membrane layer of the stomach lumen which contains the glands and the gastric pits. The human stomach lumen is lined with a monolayer of epithelial cells. The gastric pathogen Helicobacter pylori is one of the most common pathogens to colonize the stomach, and chronic infection can lead to gastric ulcers, gastritis, and gastric cancer. 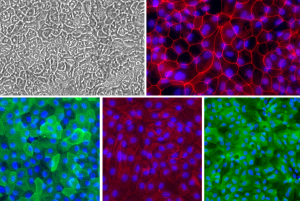 Cell Applications/tebu-bio provide a gastric epithelial culture system that results in a gastric epithelial cell monolayer with tight junction that is stable for up to a week in culture enabling effective research of gastric diseases and disorders in vitro. 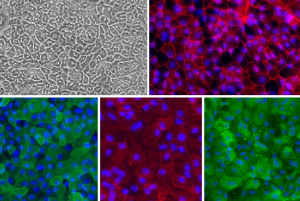 These cells provide researchers a valuable in vitro model for investigation of gastric epithelial cell physiology and their response to infection, tight junction function, as well as testing of therapeutic agents for gastrointestinal research. 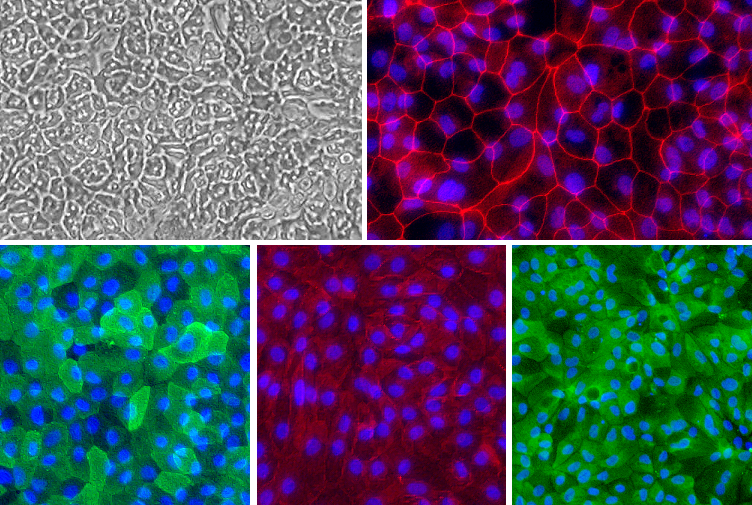 Looking for other Epithelial primary cell types or support to amplify your cell cultures ? 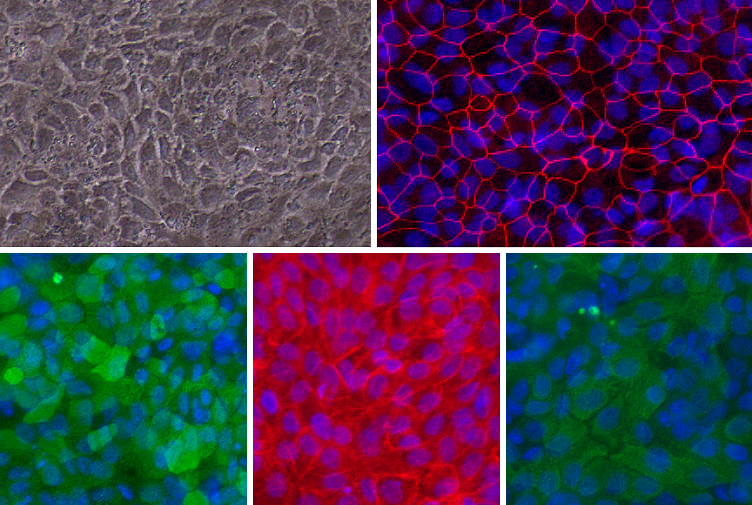 Cell Applications is going to release validated Epithelial cells from various tissular sections of the Human GI tract (eg. duodenum, jejunum, ileum). If you are looking for particular tissues, don’t hesitate to contact me via the form below. Primary cells & cell lines amplification – click here to know more about these services. 3D cell culture spheroid production lab services as described here. Recently, tebu-bio’s scientists used the HCT-116 cell line to product a batch of colon carcinoma spheroids. Cells were given the conditions to meet each other and form a cohesive and organized tissue. Spheroids capture epithelial tissue traits and respond to drugs and to 3D matrix environments in a close to in vivo manner. Colorectal carcinoma cell line HCT-116 spheroids which were then treated with paclitaxel. In parallel, Liver carcinoma cell line HepG2 spheroids were treated with staurosporine. The dose-dependent effect of paclitaxel and staurosporine on spheroid cell viability was determined with the CCK-8 colorimetric assay. These results are within the range of previously published results for paclitaxel (IC50= 4,03 and 9,5nM – Sirenko et al., 2015), and for staurosporine (IC50 =8,9±0,4 – Sirenko et al., 2015). You might like to download the results of these PoC tests here : HCT-116 Spheroids with paclitaxel & HepG2 spheroids with staurosporine. Scheperjans F. et al. “Gut microbiota are related to Parkinson’s disease and clinical phenotype”. Movement Disorders, 2015 Mar;30(3):350-8. Sirenko o. et al. “High-Content Assays for Characterizing the Viability and Morphology of 3D Cancer Spheroid Cultures” Assay Drug Development Technologies, 2015 Sep 1; 13(7): 402–414. Keshavarzian A. et al. “Colonic bacterial composition in Parkinson’s disease” Movement Disorders, 2015 Sep;30(10):1351-60. Unger M.M. et al. “Short chain fatty acids and gut microbiota differ between patients with Parkinson’s disease and age-matched controls”. Parkinsonism Related Disord. 2016 Nov;32:66-72.